Do we "carrot" all about carrots? enjoy their February 23rd, 2012 discovery of last years carrot crop. The harvest was still thriving in the Carroll County Demonstration Garden High Tunnel. 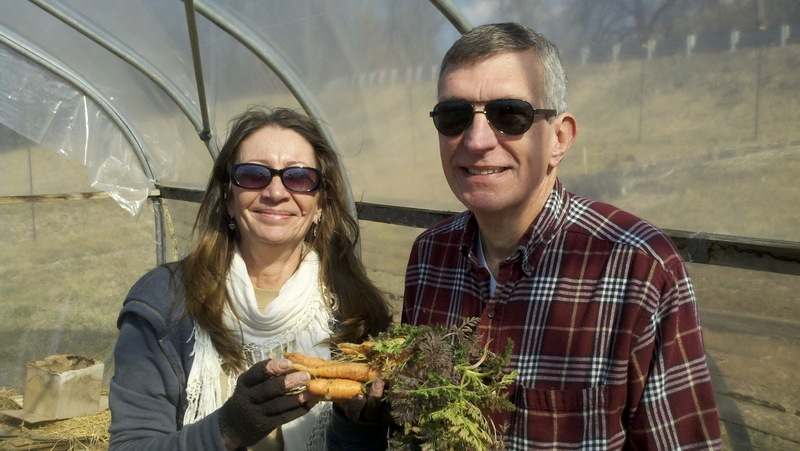 These fantastic carrots were grown in a raised bed garden with plenty of compost. Description: It is a biennial plant which grows a rosette of leaves in the spring and summer, while building up the stout taproot, which stores large amounts of sugars for the plant to flower in the second year. The flowering stem grows to about 1 metre (3 ft) tall, with an umbel of white flowers that produce a fruit called a mericarp by botanists, which is a type of schizocarp. Uses: Carrots can be eaten in a variety of ways. Only 3% of the β-carotene in raw carrots is released during digestion: this can be improved to 39% by pulping, cooking and adding cooking oil. Alternatively they may be chopped and boiled, fried or steamed, and cooked in soups and stews, as well as baby and pet foods. A well known dish is carrots julienne. The greens are edible as a leaf vegetable, but are rarely eaten by humans. Together with onion and celery, carrots are one of the primary vegetables used in a mirepoix to make various broths. In India carrots are used in a variety of ways, as salads or as vegetables added to spicy rice or daal dishes. The most popular variation in north India is the Gaajar Kaa Halwaa carrot dessert, which has carrots grated and cooked in milk until the whole mixture is solid, after which nuts and butter are added. Carrot salads are usually made with grated carrots in western parts with a seasoning of mustard seeds and green chillies popped in hot oil, while adding carrots to rice usually is in julienne shape. The variety of carrot found in north India is rare everywhere except in Central Asia and other contiguous regions, and is now growing in popularity in larger cosmopolitan cities in South India. The north Indian carrot is pink-red comparable to plum or raspberry or deep red apple in colour (without a touch of yellow or blue) while most other carrot varieties in world are from orange to yellow in colour, comparable to Halloween pumpkins. Ever since the late 1980s, baby carrots or mini-carrots (carrots that have been peeled and cut into uniform cylinders) have been a popular ready-to-eatsnack food available in many supermarkets. The sweetness of carrots allows the vegetable to be used in some fruit-like roles. Grated carrots are used in carrot cakes, as well as carrot puddings, an old English dish thought to have originated in the early 19th century. Carrots can also be used alone or with fruits in jam and preserves. Carrot juice is also widely marketed, especially as a health drink, either stand-alone or blended with fruits and other vegetables. Companion Planting: While not proven, many believe carrots are useful companion plants for gardeners. There is experimental evidence that growing it inter cropped with tomatoes increases tomato production. If left to flower, it (like any umbellifer) attracts predatory wasps which kill many garden pests. Nutrition: The carrot gets its characteristic and bright orange colour from β-carotene, which is metabolised into vitamin A in humans when bile salts are present in the intestines. Massive over consumption of carrots can cause carotenosis, a benign condition in which the skin turns orange. Carrots are also rich in dietary fibre, antioxidants, and minerals. Lack of vitamin A can cause poor vision, including night vision, and vision can be restored by adding it back into the diet. An urban legend says eating large amounts of carrots will allow one to see in the dark. The legend developed from stories of British gunners in World War II, who were able to shoot down German planes in the darkness of night. The legend arose during the Battle of Britain when the RAF circulated a story about their pilots’ carrot consumption as an attempt to cover up the discovery and effective use of radar technologies in engaging enemy planes, as well as the use of red light (which does not destroy night vision) in aircraft instruments. It reinforced existing German folklore and helped to encourage Britons—looking to improve their night vision during the blackouts—to grow and eat the vegetable. Ethnomedically, the roots are used to treat digestive problems, intestinal parasites, and tonsillitis or constipation. A guy walks into a doctors office with a carrot in his ear and a piece of celery up his nose. The doctor told him he wasn’t eating right. ← That’s what I’m taking about – Parsnips! Any tips on growing carrots? First time gardner last year and I ended up with 2 inch and very bitter carrots. They were planted in a 12 inch raised bed filled with a loose mixture of compost/vermiculite/peat moss. Thanks!